Coble at Beadnell. Photo by Glasgow University. The small village of Beadnell surrounds its harbour amid sand dunes a few miles south of Bamburgh. Uniquely for a harbour on the east coast of Britain the harbour entrance faces west. Once a thriving fishing village it is now mainly a centre for holidaymakers, though some fishing still occurs. The land immediately around the village is low-lying, and typical of the flat coastal plain of Northumberland. In prehistory there was clearly settlement in the area. The earliest evidence we have is a polished stone axe found at Annstead, belongs to the Neolithic period. Later, in the Bronze Age there are the remains of at least one burial mound. It contained prehistoric burials and part of a Bronze Age pot. A Late Bronze Age spearhead has also been found in the parish. A simple object like this might have been lost by the person using it, or it could have been hidden on purpose, possibly as an offering to the gods. For most of the Roman period much of Northumberland would have been far beyond the frontier of the Empire. This means few Roman goods would have reached this far north, and certainly no Roman period sites are known from Beadnell, though it is possible that some of the Iron Age sites mentioned above may have lasted into this era (AD43 to 410). The earliest medieval reference to Beadnell comes in 1161, though there must have been settlement there before this point. It was held by the manor of nearby Bamburgh. There are a number of buildings in the parish that date to this period. Although the medieval parish church was demolished and rebuilt around 1750 the present chapel of St Ebba mentioned earlier was probably built in the 11th or 12th century. There was also a chapel at nearby Tughall, which is believed to have been built on the spot that St Cuthbert's body rested when travelling back to Durham in 1069. This was also probably built in the 12th century. As well as the village of Beadnell itself there were a number of other settlements in the parish. It is believed that there were villages at Elford and Fleetham, though in both cases these are now greatly reduced in size. The remains of many medieval fields are also visible just outside Beadnell. They can be recognised by the distinctive ridge and furrow pattern that they leave. In the later medieval period, when there was an increased threat from raiders from over the border in Scotland, as well as from Northumberland, a fortified tower house was built. It is now part of The Craster Arms. Another tower is known at West Fleetham. In the post-medieval period Beadnell got much of its wealth from the sea. The small harbour was built in the 18th century. The fishing boats working from this harbour mainly went after herring, which were dried in a now demolished drying house and exported. The harbour also exported lime made in the lime kiln on the harbour itself and on Beadnell Point. Another, less reputable, source of income exited in the form of smuggling. In 1762 a haul of over 2700 gallons of brandy, 1000 gallons of wine and 400 gallons of rum and gin was landed. This was clearly a thriving, if illegal, industry. There were, of course, industries in the area that were not reliant on the sea. The large mill at Fleetham is testament to the continued importance of agriculture. The wealth still to be found in agriculture in the 19th century is reflected by a number of fine farmhouses, such as Tughall Farmhouse and its associated cartsheds. In the late 19th century the fishing industry in the village began to decline. 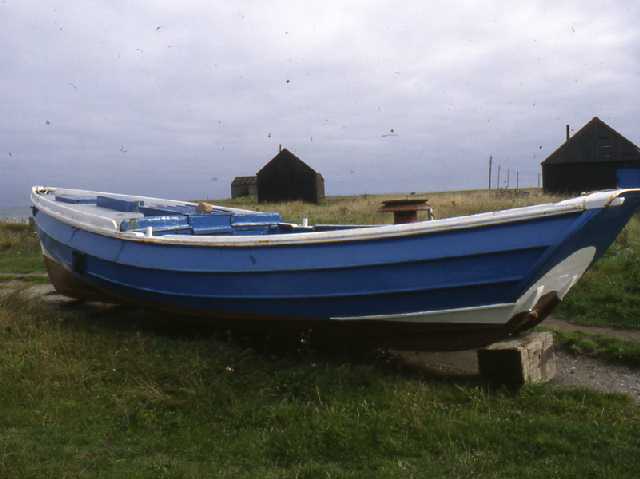 The herring shoals were getting smaller, and there was a move amongst British fisherman to use larger steam-powered trawlers, which the small fisherman of Beadnell could not afford. Today the main role of the village is as a centre for tourism. The sheltered waters of Beadnell Bay are ideal for windsurfing and sailing, and there are a number of hotels and camping sites in the village. A few fishermen continue to fish the coastal waters around the village, and more recent remains of Beadnell's links with the sea can be seen just off shore, where the wrecks of The Mistley and The Yewglen can still sometimes be seen.